Founder & Chairman, ICCUSA Foundation, Inc.
Maurice A. Buckley, was born in the North of England. He formed his own company at the age of 22. The company provided designs and rubber printing plates for the packaging industry, using water based inks. The company grew at a rapid pace, as this sector, had never done printed boxes or flexible packing. They received the Queens Award for tech knowledge. Maurice along with his close friend Michael W. J. Smurfit bought and ran a very successful public company in Ireland. Maurice moved to America in 1985, where he came to work, as President and Chief Executive Officer of Pamarco, a company in New Jersey providing rollers for the packaging sector. In 1988, Michael W. J. Smurfit and himself, founded the Ireland Chamber of Commerce – USA (ICCUSA). 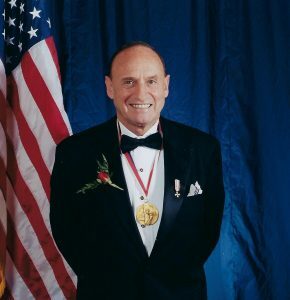 He is also a recipient of the Ellis Island Medal of Honor Award, given to him in 2000. On the personal side, Maurice was a passionate rugby player, marathon runner, golfer and skier. He devoted his free time to youth programs. He belonged to the Council of Youth-Latchford-Hospital Broadcast. At the age of 19, along with the Council, started the first radio broadcast in hospitals in England. They recently celebrated 50 years. Maurice helped to raise funds for the Special Olympics in Ireland and worked with the late Hugh O’Brien to build, the now very successful not-for-profit, HOBY. Maurice founded The ICCUSA Foundation, Inc. in 2008, also known as The Albert Schweitzer Leadership for Life Foundation, with the total support of Albert Schweitzer’s only daughter, Rhena Schweitzer Miller. The Albert Schweitzer Leadership for Life International Youth Leadership Conference has been held in Ireland for the past nine years. He started the conference in Ireland because of his love for the country, he always has considered home. He wanted the students who have attended the conference through the years to experience the same Irish warmth, that he received for the past many years. The conference is a wonderful opportunity for students with different race, ethnicity and religions to work together and learn about each other’s different cultures. To make the world, we live in, a better and peaceful place. He hopes that when he is long gone, his legacy will continue on.